Healthcare reform is here to stay. Now that the U.S. Supreme Court has upheld the constitutionality of the Affordable Care Act (ACA), healthcare organizations must reassess their progress on the key initiatives contained within. For a concise snapshot of industry activity in ACA priority areas, healthcare executives should look no further than the 2012 Healthcare Trendtracker: Real Data on Adoption, Outcomes and ROI. Who's on the care team in the patient-centered medical home? What's the greatest challenge of creating an accountable care organization? Which health conditions are benefiting from the use of telehealth? What strategies are reducing avoidable Medicare readmissions or fostering appropriate ER use? 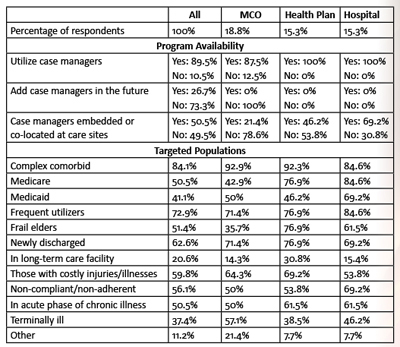 How and where are case managers being utilized to improve care coordination? How can a pharmacist help with medication adherence? Which patients should you track in a registry? View the preview of "2012 Healthcare Trendtracker: Real Data on Adoption, Outcomes and ROI." There are dozens more tables like this. This quick reference of program implementation, characteristics, results and ROI from 2011 and 2012 market research is a must-read for C-suite executives charged with setting a healthcare reform agenda that will improve quality and enrich clinical outcomes. * Includes 2010-2012 year-over-year data on these topics. These metrics are assembled from the latest market research conducted by the Healthcare Intelligence Network. 2012 Healthcare Trendtracker: Real Data on Adoption, Outcomes and ROI is the latest Healthcare Intelligence Network resource designed to empower healthcare companies to assess strengths, weaknesses and opportunities to improve by comparing organizational performance to reported metrics.